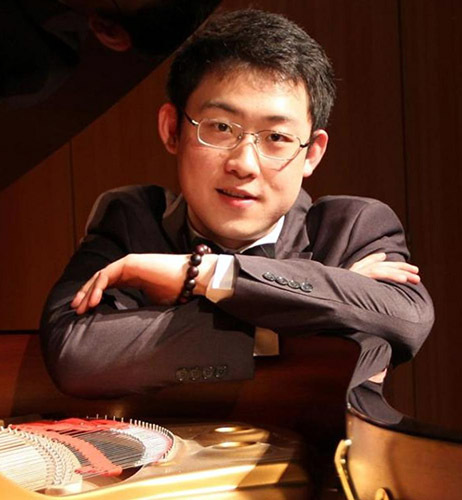 The young Chinese-born pianist , a candidate for NEC’s DMA, Ziang Xu is a mentee of Vladimir Feltsman, Victor Rosenbaum and, currently, Bruce Brubaker. Having completed his bachelor’s studies at Mannes School of Music, he came to NEC and completed his MM last year. Xu, who garnered first prize at the 27th New Orleans International Piano Competition in 2018 and has won several other piano competitions, is clearly a phenom. NEC DMA candidates play three solo recitals; in delivering the first of these requirements in Williams Hall on Monday, Xu evidenced prodigious technique, coupled with an ability to create phrasing ranging from tender to stentorian in a formidable program: Liszt’s Sonata in B Minor and Beethoven’s Opus 111. The many extraordinary moments left this writer eager for his two more appearances here. The innovative and still challenging Liszt Sonata requires masterful attack as well as piano whispering. The single movement unfolds with some of the characteristics of a three- or four-movement piece as it cycles through its five motifs. Within the first theme, Xu demonstrated both the breadth of his phrasing and his ability to coax huge and secretively soft sounds from the instrument. His statement of the introductory Lento assai lent majesty to the start, followed by the Allegro energico. He gave the Fugato section the requisite diabolical drive until the condensed reappearance of the initial motif. Here, Xu modulated the contrapuntal aspects skillfully. One might have quibbled with some of Xu’s sostenuto pedaling or expression, but the traversal provided great excitement overall. One can also debate as to what inspired the B Minor Sonata. Was Liszt thinking about the Garden of Eden and the fall of man, of Faust or of something autobiographical? During a free NEC Piano Seminar on April 19th at 10 AM, the Liszt expert Claudius Tanski will be presenting his theory that Liszt had encoded specific references to the Trinity in the work. You can hear Xu’s award-winning New Orleans performance on YouTube HERE. Ziang Xu himself is “way cool;” I’d predict that his unique pianistic voice will reward audiences for years to come. Pianist and long-time music lover Julie Ingelfinger enjoys day jobs as professor of pediatrics at Harvard medical School, pediatric nephrologist at MassGeneral Hospital for Children and deputy editor at the New England Journal of Medicine.